A movie that had potential but is overall very forgettable. Made for people who enjoy awkward sexual humor. Dinner For Schmucks is about a man named Tim (Paul Rudd) who is a rising executive but before he can be promoted to his dream job he must first attend his boss Lance Fender’s (Bruce Greenwood) monthly dinner event and bring a guest. The whole gag being that this dinner is a “dinner for idiots” which offers certain advantages to the exec who shows up with the biggest loser. 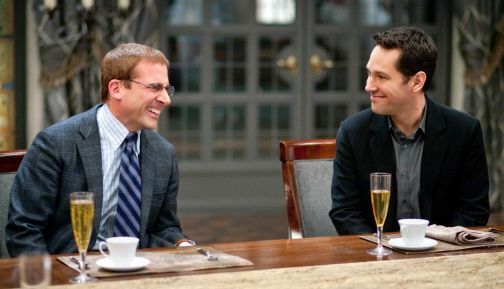 Barry (Steve Carell) ends up becoming the “winner” Tim decides to take to the dinner. By day he is an IRS employee but his real passion is taxidermy and he specializes in what he likes to call “mousterpieces”. Essentially he takes dead mice, dresses them up and has them recreate famous masterpieces of art. Almost everything Steve Carell does in this movie will make you laugh in the moment but after seeing the film you’ll think back and have trouble remembering what exactly was funny about it. The film itself as a whole is very forgettable. I saw the movie two days ago and I am already struggling to remember a lot of it. One thing that I didn’t like is for a PG-13 movie I felt this movie went a little too far. There was a lot of really strong sexual references and jokes. Things that were very awkward and unnecessary. One character named Darla (Lucy Punch) is a stalker trying to win back Tim. Everything she does is just terrible. This is not a movie you would want to sit through on a first date. For example, in one scene Darla is at lunch and she uses her lipstick to write on a napkin “I’M WET” and passes it to Tim. He as a result freaks out and bumps the napkin to Barry. He doesn’t see the message written on it and since he already has a napkin he passes this one to the client Tim is trying to impress. The client opens up the napkin, reads the message and looks at Barry’s crotch then at him with a smirk on his face. Crap like that just bothered me and is just one of many sexual jokes they make in this film. The acting was good and the story was decent but realistically this is one of those movies that you will most likely regret paying for full price. If you are going to see Dinner For Schmucks either “Redbox it” or hit it up at the “Dollar Theater”. Then again, if you skip out on it entirely you won’t regret that decision either. Well, that’s not true, you might regret not being able to see Jemaine Clement dressed up as a goat. At the very least you may need to hit this up at the Redbox for that.